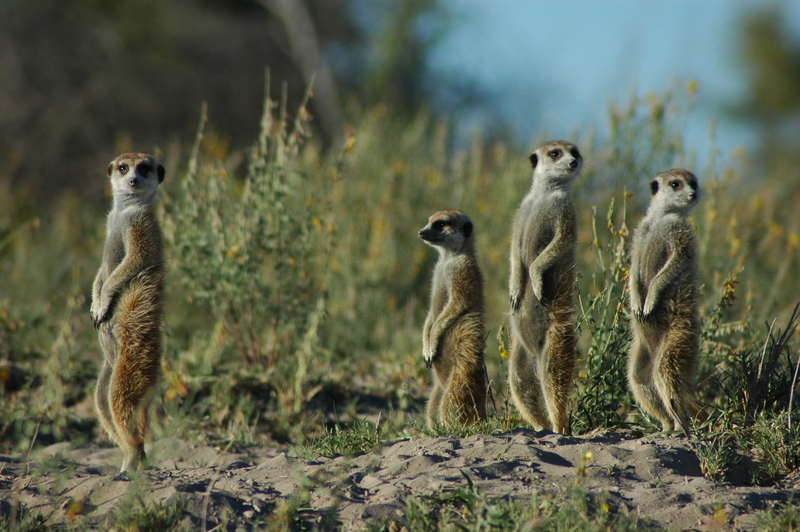 Located in north eastern Botswana, just outside the eastern boundary of the Makgadikgadi National Park, Jack’s Camp is one of Botswana’s more unusual destinations. Originally built by Jack Bousfield in the early 1960’s – as a base from which to explore the pans – and inherited by his son, Ralph, following a fatal aircraft accident, Jack’s Camp has been open for business as of 1993. The perfect base from which to explore some of the largest salt pans in the world – combined, the Sua and the Ntwetwe cover an area of approximately 12,000km2. The pans are what remain of a once vast superlake that covered much of central Botswana. At the time there were considerable big wildlife populations (elephant, hippo etc), which all died out or moved on when, about 1 million years ago, a huge geographic fault diverted the flow of the Chobe, Zambezi and Kuando Rivers east and away from the lake. Subsequently the only river to flow into the lake was the Okavango, and so the lake dried up and these vast salt pans were formed. Sheltering in the shade of a cluster of real fan palm trees, Jack’s Camp consists of a peaked mess area and 8 pioneer sleeping tents. The main area includes a dining tent, a lounge, bar, library and outdoor seating area, all of which look out onto the pans. The imaginative main dining area tent is flanked by two adjoining reading rooms to either side. On display is an amazing array of skulls, skeletons, feathers, fossils and other local finds, enough to keep the interested observer happy for hours. Until very recently without electricity, and once a cold water only destination, the emphasis at Jack’s Camp is always on simple comforts, on the quality of rest, on the standard of its food and its service. This idiosyncratic excellence takes pride on focussing its guests’ attention on tiny signs – spoors, fur, fragments of bone – and on almost incomprehensibly huge scales, such as the aged pans themselves. 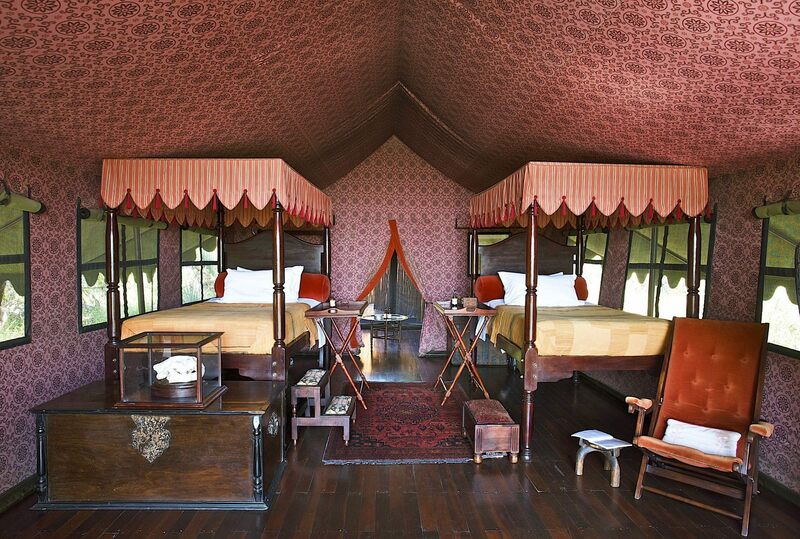 The sleeping accommodation is composed of ten en suite tents, set under a vast fly-sheet and raised up onto wooden decks. The tents are scattered along the outer boundary of the palms, facing outwards over the pan. There are two double tents and the rest are twins. 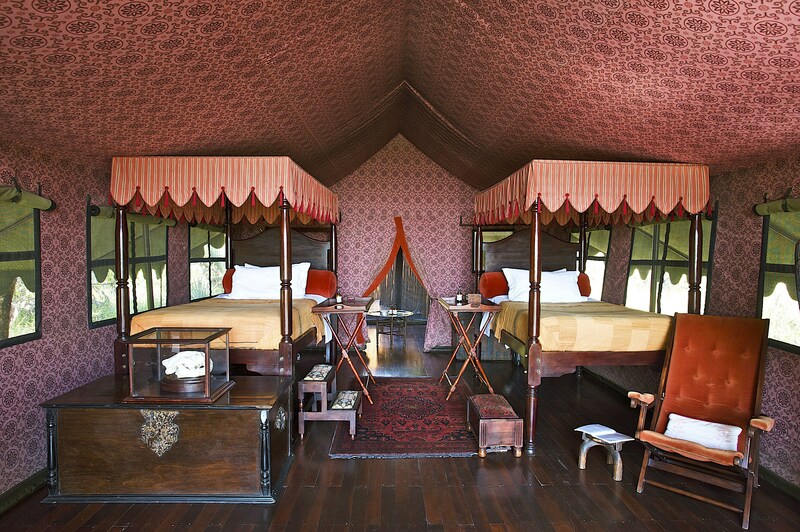 The beds are four posters, beautifully made and their medieval style draping is the same design and colour as the tents’ inner lining. The furniture and decor is also marvellously well thought through: delicate antique dressers, elegant fold up bedside tables, foot chairs, old director’s chairs, writing tables – and the bathrooms of Jack’s Camp possess flush toilets, hot and cold running water and showers. Please note there is no Wi-Fi at the camp. In the wet season (November through to March) large herds of zebra and wildebeest are drawn into the area by seasonal water on the pans. However this dries up quickly, the wildlife disperses and the pans appear deserted yet again. Except for a few desert specialist species little remains in the dry season (April to October) and there is very little big wildlife to be seen – but this is not the point of the camp or the area. For these reasons, the activities are based more around the process of discovery than simply viewing. They include day and night wildlife drives – exploring the pans in 4×4’s and quad bikes; guided nature walks with local San trackers; and trips into the park. Longer excursions include a four night quad bike expedition to Kubu Island, southwest Sua Pans. 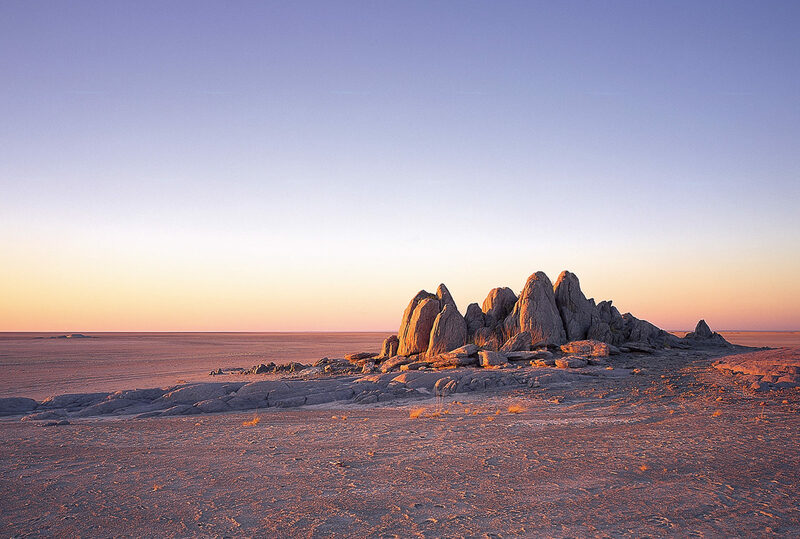 Kubu Island is an isolated granite rock from which gnarled baobabs grow and is considered sacred by the local San; such is its spiritual significance. “The Makgadikgadi is a place to simply be, to listen to the wind in the grass and the salt cracking beneath your feet on the pans. The quality of the guiding is exceptional and it never ceases to amaze me how much more there is to the bush than first meets the eye – particularly if it is a barren salt pan or a spiky salt-grass savannah! 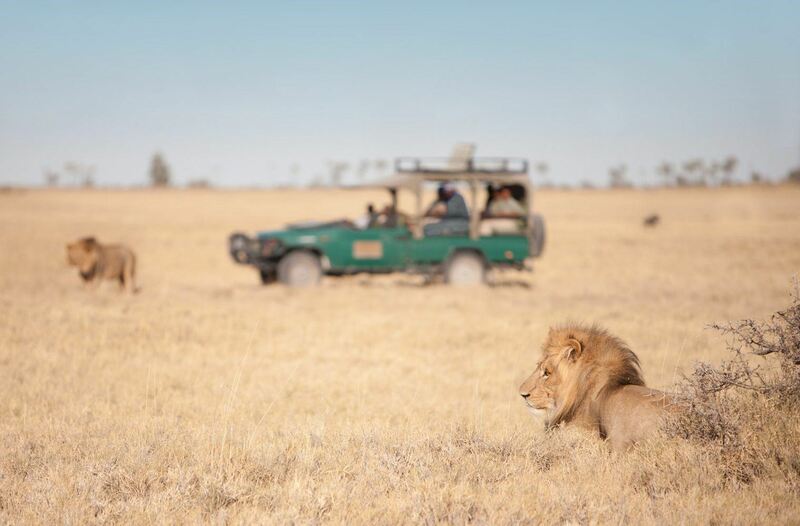 “As the big wildlife is so sparse during the dry months and the experience so specialist I would strongly recommend leaving Jack’s to last in an itinerary. I feel that it is advisable to first see the big game and then move down to the wilderness where you can truly appreciate this exceptional landscape without the restless urge to see more wildlife. Jack’s provides you with the opportunity to think and reflect on where you are and what you have done. The filtration equipment used in the swimming pool – an imported copper ozone system from the United States – prevents the use of chemicals such as chlorine, instead employing oxygen to keep the pool clean. The camp has also begun switching from gas and electrical sources to solar; the lighting, geysers and some fridge and freezers are now powered using solar energy. Fresh herbs are found in the kitchen garden, which itself uses compost from the camp’s plant matter. Zimbabwean Teak is the only wood used in the building of the swimming pool, and all other new projects on the camp are sustainably developed. To find out more about Jack's Camp and to arrange your tailor-made trip, get in touch with us today.